There are several basic settings that can be changed in regards to wishlist. You can choose to disable the wishlist features at any time. After deactivating the wishlist features customers will no longer be able to look at public wishlits or manage their own lists. Links to public wishlists will lead to 404 error pages which will affect search engine rankings. 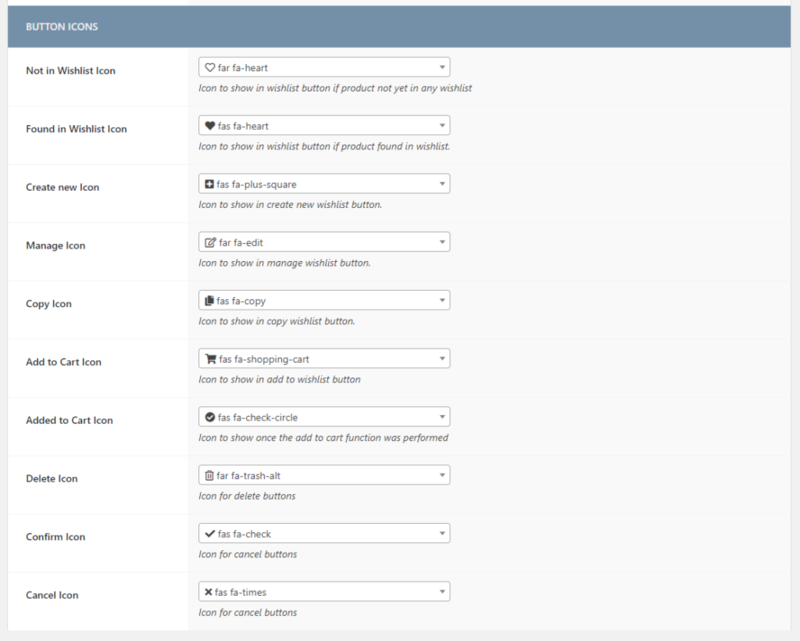 Upon installation the plugin creates a new page containing the necessary shortcodes to display visitor wishlists, recent wishlists as well as a table containing all currently available public wishlists. We strongly recommend to only change this setting directly after the initial setup. Changing this setting on a production system will lead to 404 error pages since the links to all public wishlists will be different. If you choose to change the standard wishlist page anyways it is necessary that you head to „Settings“ -> „Permalinks“ inside of WordPress and save the page. This will flush the permalinks which is needed for the changes to take affect. 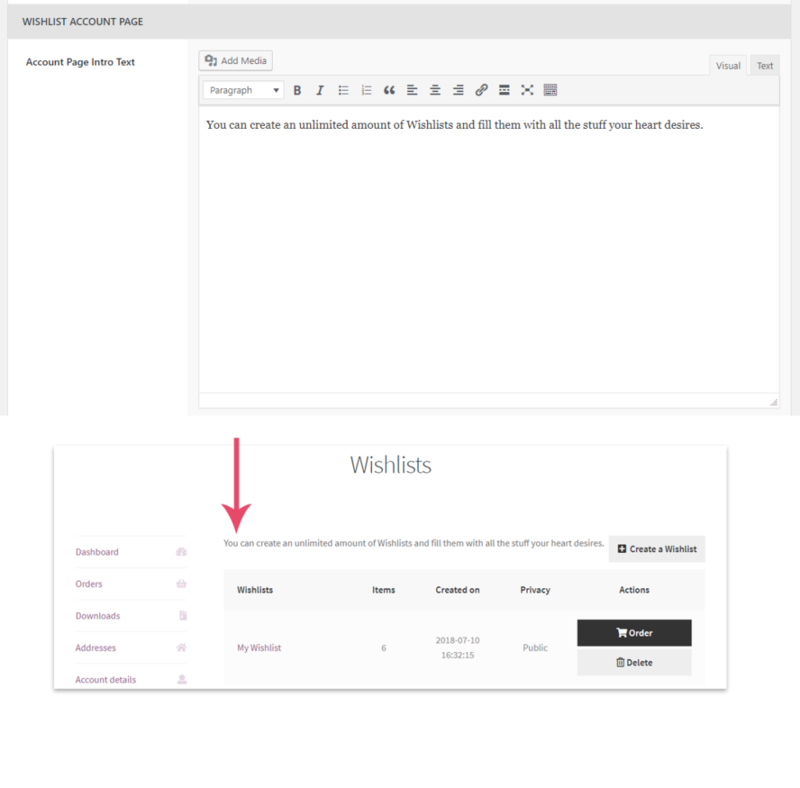 The wishlist copying feature lets users copy any public wishlist to their own list, this includes all products in the cart, the desccription as well as the title. The feature is limited to wishlists that are created by users who are not the owner of the list. You can choose to not display the copy button by disabling the checkbox. 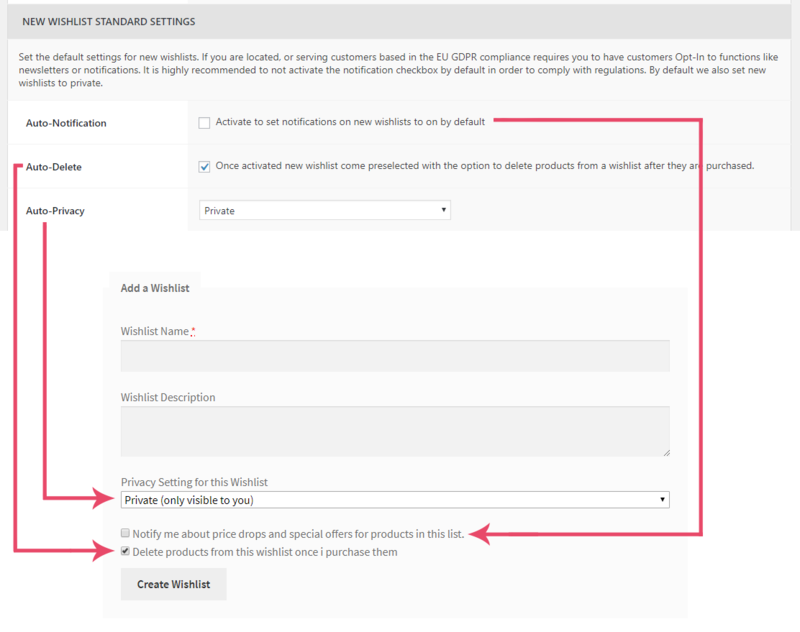 You can change what options are enabled or selected when customers create new wishlists. If you want that all new wishlists automatically come preselected with the option of receive notifications you can do so. Please keep in mind that these settings should be handeld with care, especially if you are located inside of the EU. With the implementation of new privacy rules it is recommend that shop owners don’t preselect options through which users opt-in to receive promotional material. „Auto-Delete“ – This setting defines that products inside the wishlist should be deleted after the customer purchases them. This option lets you change the text that is beeing displayed on the „Wishlists“ page inside of the users account settings. 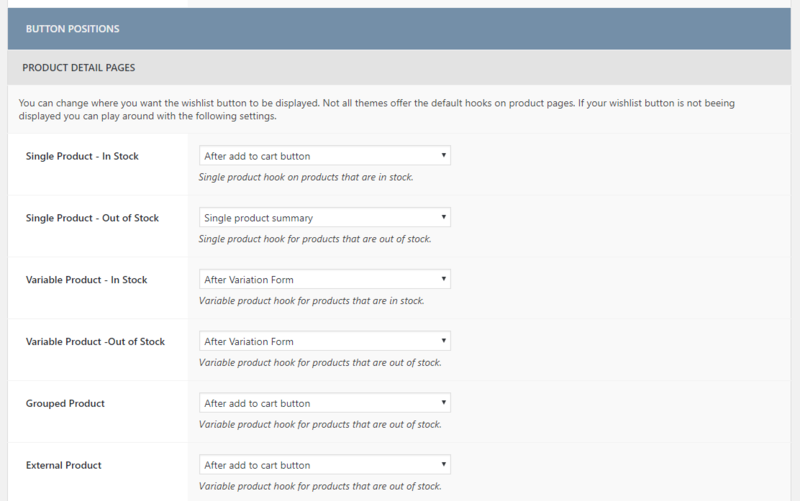 You can change the position of wishlist buttons depending on the type of product and depending on the stock status. Many themes don’t support many of the default hooks. If a wishlist button is not beeing displayed on a specific product type you can change the position here. Right under the settings for product detail pages you will find another section that deals with button positions on category pages. Displaying a wishlist button directly on product categories can be a big problem since many themes are not designed to support additional buttons. The plugin offers three points for the button to hook into. If none of the available display styles work with your theme we recommend to not display wishlist buttons on product categories. The last section allows you to change the icons that are beeing used in buttons related to wishlist functionality. If you change the FontAwesome version beeing used all icons in this list need to be selected and again.